Happy Halloween! These cupcake toppers are so adorable and will add a little fun to any Halloween party or get together! I made these a couple of weeks ago for some of Landon's co-workers and girls (with some ghosts, too), as well as for our Halloween party at work today! 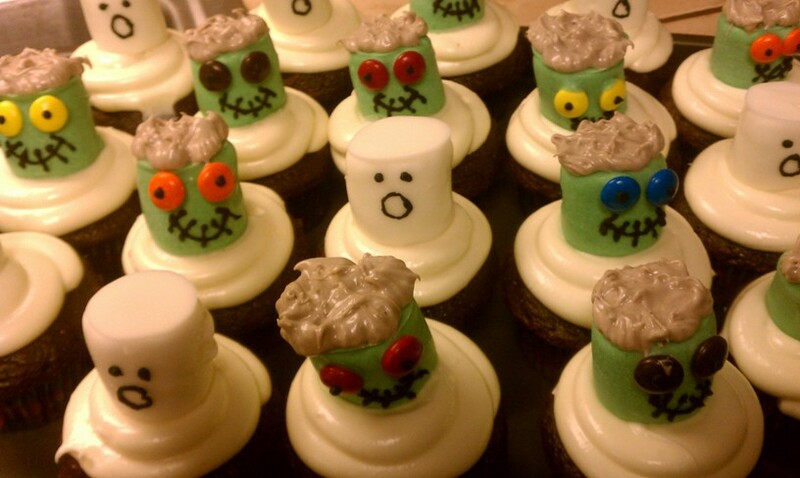 I did the ones for work a little differently than the ones pictured, using black sanding sugar for Franky's hair instead of the spiked up frosting look. I loved both ways! Melt the white dipping chocolate according to the directions. Add green food coloring until desired color. Dip the tip of a lollipop stick into the chocolate and place in the center of a marshmallow (the flat end, not the center of the round side). This will help hold the stick in place. Place in the freezer for 10 minutes so that the chocolate hardens. Once hardened, take out of the freezer and dip the entire marshmallow into the green chocolate. If using sanding sugar, dip the flat end into the sugar so that it coats the whole end. It is OK if it goes onto the side. Place two M&M's near the top of the marshmallow, just under the sanding sugar. Let dry completely. When dry, take the lollipop stick out of the marshmallow. 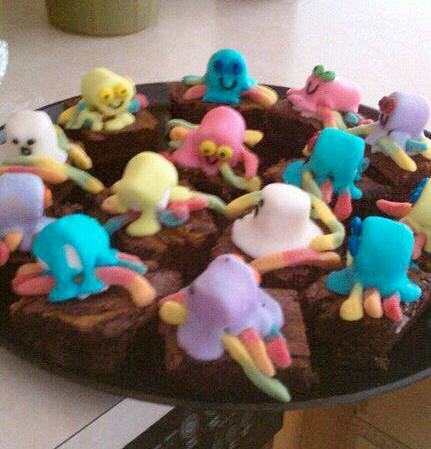 Pipe on the mouth and eye balls with the black frosting. If using frosting for the hair, pipe on the frosting now. Spike up with a toothpick. Easy as pie :). Except when you make 300 of them. Not my first suggestion, but they are definitely fun on a smaller scale. Enjoy! This time of year marks some very humongous events that have forever changed my life. *One year ago this week I discovered the enormity of the food blogging world. 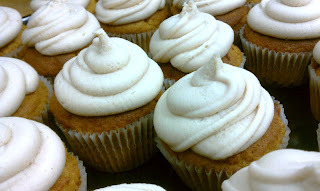 *One year ago this week I discovered my now-favorite passion - baking and creating goodies. *One year ago this week I made the most creative thing that I had ever made in my entire life - these spooky spiders and ghosts. 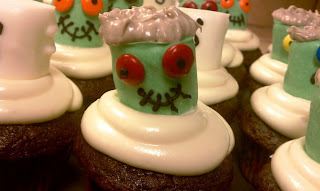 These were made for our Halloween party at work, as well as for all of the students.These little guys brought a creative side of me that I didn't know existed, and I am literally getting teary-eyed just thinking of just how much they mean to me. Now, the picture I have is one that I posted to my Facebook a year ago, so it's not the greatest, but these little guys will forever hold a special place in my heart. 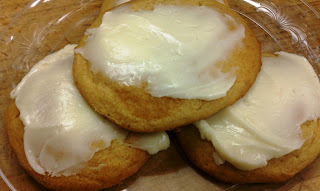 You can find the recipe of how to make them here from bettycrocker.com. Luckily they have the cutest little picture with the recipe, so that you can see what they look like up close and personal. They will be a huge hit wherever you take them, and they will not fail to bring a smile to everyones face! You just can't help but be happy around these cutest little dudes. If you are having a hankering for something sweet, this is it folks! I am absolutely in love with the presentation of this dessert, but it's the amazingness of it's sweet being that takes the cake - literally. 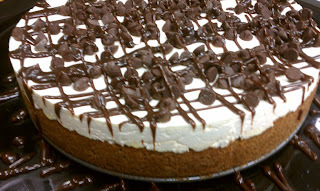 It might even be too sweet for some, but even if you just take a bite or two, I promise you won't regret it. I saw these cookies on Pinterest and dreamed about them for days. There were several occasions that I about made them after dinner, but I really have done fairly well at eating pretty good and working out before work. So I did the next best thing. I made them for dessert for the students! Man oh man, these little babies are DELICIOUS! That frosting is something else. And the cookies literally melt in your mouth! It seems like salted caramel is the new "thing". It is everywhere. I have always thought it sounded good, but really didn't get the big deal. Then I made it for this buttercream. Man oh man, this stuff is GOOD. I was skeptical about the buttercream, since I really am not a huge fan, but this buttercream is pretty tasty. I am still not the biggest fan of the texture, but the salted caramel flavor is really so amazing! So, I found this recipe on Pinterest - of course - and tried to follow it word for word. But this was my problem. The cupcakes turned out fabulously. Really - so good! Then I got to the frosting. I tried to make the "salted caramel" twice, then gave up. In the recipe it says to let the sugar and water boil until it reaches a deep amber color. The first time I tried to wing it, while not really 100% sure what a deep amber color looked like. When I added my cream to mix in once it had reached what I thought was deep amber, the caramel got hard as a rock and the cream did not mix in at all. So I knew I cooked it too long. So I tried again. This time, however, I decided to Google what deep amber looks like. That was as much help as trying to get my puppy help me bake. Please, I beg you, Google what deep amber looks like. It is about as clear as mud. So I decided I would just let it be a bit lighter than my first attempt and was really feeling good about it this time. I added my cream, and again - hard as a rock. This is when I gave up. At least on that caramel recipe. I decided to look up another recipe for a salted caramel buttercream, but I wanted one that used a candy thermometer so that there was no color guessing, no texture guessing. I wanted crystal clear directions. After looking over a few recipes, I still couldn't find one that used a candy thermometer. However, I decided to just pick one and try it. These were my directions. Simmer until thickened; about 3-4 minutes. Ugh. How thickened would they like it to be? I had no idea. I attempted to guess for awhile, at least to what my idea of what the thickness should be, which was way longer than 3-4 minutes I might add, until I had a genius idea. I have made caramel a time or two and decided that I would just use a candy thermometer anyway. I figured if I let it get to about 230 degrees, just under soft ball stage, that it would work great because it would still be pourable, yet still have a firmness to it. So that is what I did, and it WORKED! Yay. You can try and guess if you would like, and if it works my hat goes off to you. I need much more clear directions, because I am just simply not that cool. 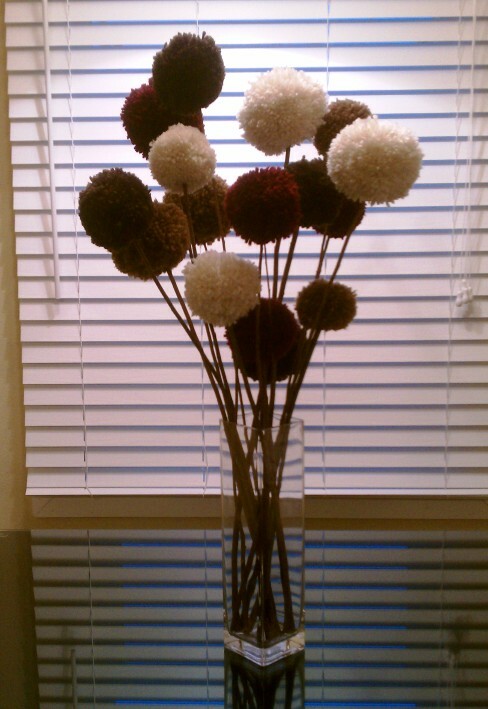 I finished my first Pinterest inspired crafting project about a week ago. 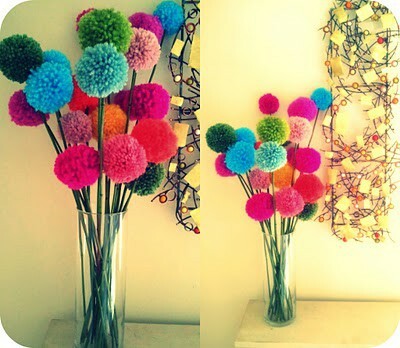 I am loving my little pom pom flowers! They turned out so cute, and I have even had a request to sell them at the upcoming boutique at work! 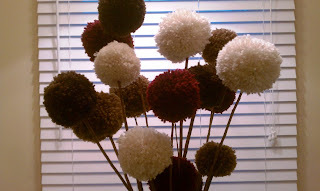 I am already going to be selling some cake pops and cupcakes (maybe), so why not throw in some adorable pom pom flowers? How cute are they?? 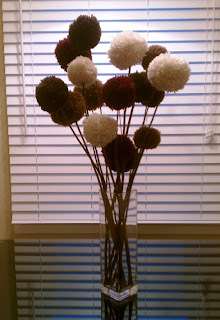 The tutorial is from Ivey Handcrafted - if you, too, would like to make these cutest little guys! Or, if you don't want to spend the time, drop by the Heritage Boutique on November 3-4 and I will have some for you to purchase! If you want more info on the boutique, just e-mail or leave me a message on this post and I would be happy to give the low-down! And, I have some exciting news! There has been a new addition to our little kitchen family. 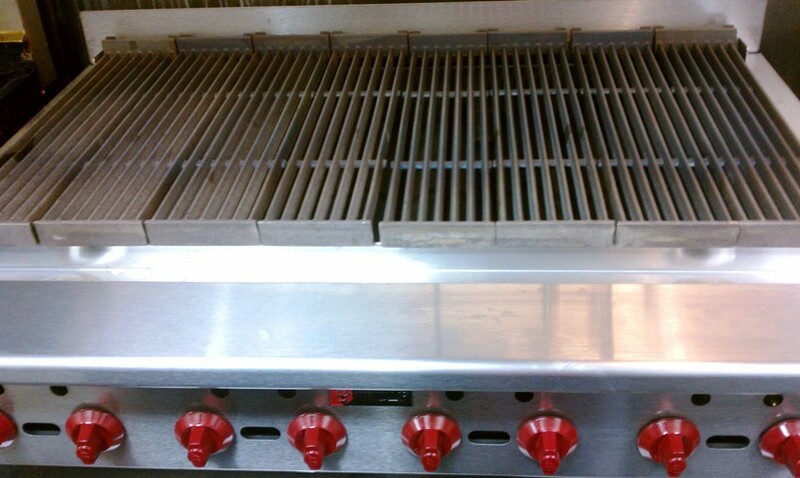 Welcome our new charbroiler for all of our steak, hamburger, chicken and pork chop needs! We have already used it a couple of times and pretty much love it! We have determined, however, that we need to be more on the ball and have it preheated and ready to go, or else a 4 oz. piece of chicken takes 45 minutes. That is no bueno. But we will get the hang of our new toy, don't you fret! I am already loving the beautiful presentation it gives, and of course everything tastes better straight off the grill! 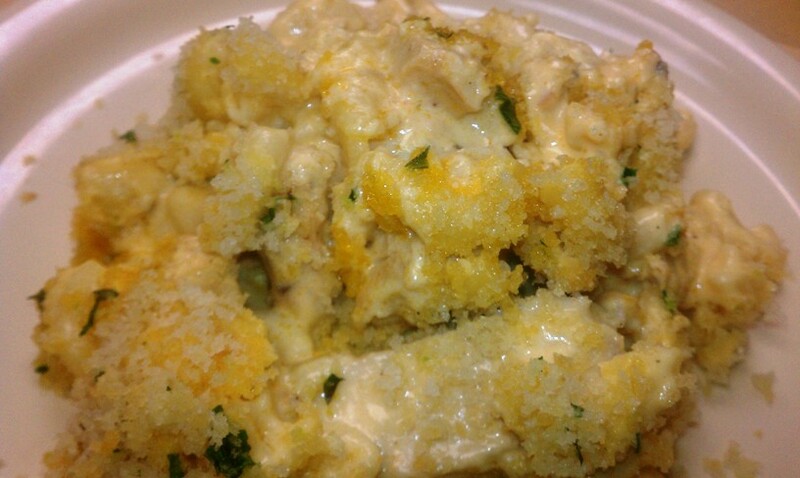 This buffalo chicken mac & cheese is simply amazing! I am not the biggest buffalo sauce fan, at least not straight up. But this mac and cheese is to die! The buffalo sauce just gives it the slightest tang and little bit of kick, and the crunchy breadcrumb topping just adds that perfect little bit of texture. I am in LOVE with this recipe! The students actually loved it, too. This will be on my menu for the long haul. I made this garlic naan to go with my slow cooker chicken tikka masala and basmati rice. It's funny, because when I decided to make the slow cooker chicken tikka masala, I did it so that I could be lazy yet still have a delicious Indian meal. 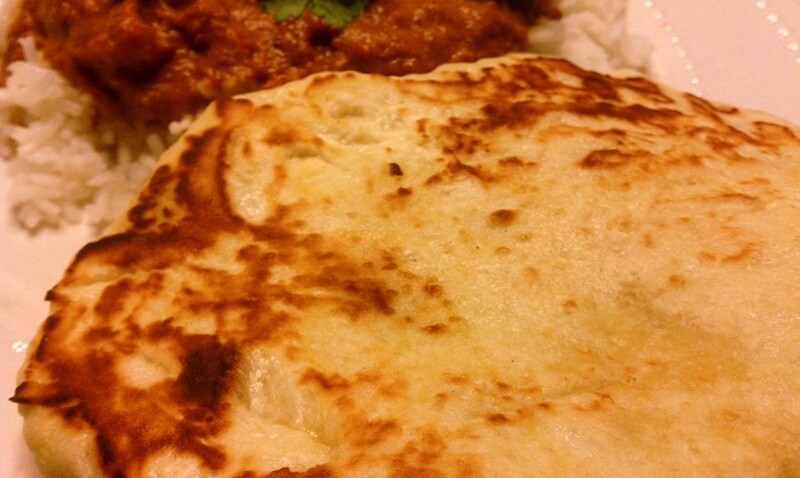 Then, for some reason, I decided to make some homemade naan. That immediately made my lazy day not so lazy anymore. Not that it is a difficult recipe to make, but there are a few steps that go over a good couple of hours. Anyway, at the end of the day it was extremely delicious - the whole meal. It definitely would not be the same without the naan to scoop up the saucy masala! You must make this meal in it's entirety. If you have never had Indian before, this is something that most people enjoy (or so I hear), and I think it awfully tasty myself! 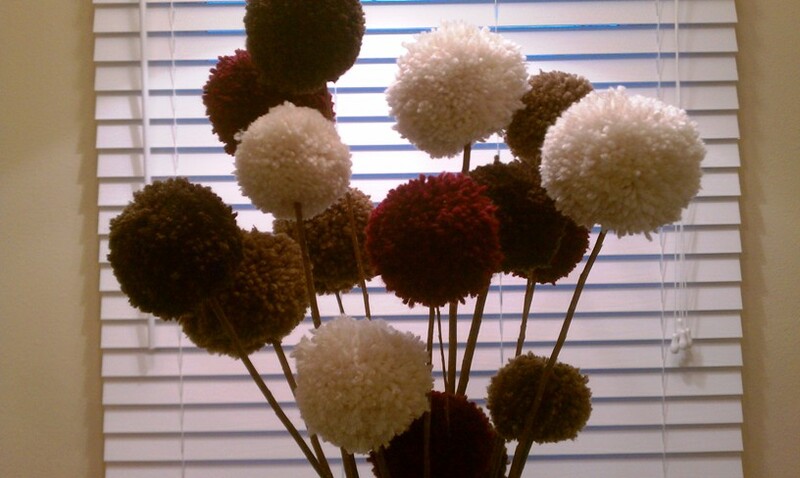 Only my "flowers" are cream, light brown, dark brown and maroon. Oh, I am so excited! I will post my very own picture when I am finished! I am also excited that I decided on this project, because in order to complete it I had to buy my very own hot glue gun! Imagine the things that I can make now. The possibilities are endless! 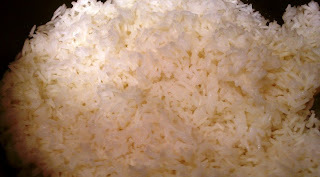 I really liked this recipe for basmati rice! It worked perfectly to go with my slow cooker chicken tikka masala. It will definitely be my go-to rice recipe from here on out! This recipe is the second chicken tikka masala recipe that I have made. The recipe here is the recipe that we use at work. 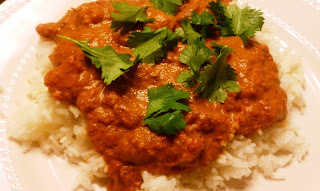 It is pretty yummy, but I like this slow cooker chicken tikka masala more! I LOVE this dish at the Bombay House, and I think this recipe is even more similar to the one that they serve there. It is thick, rich, and with just a little kick. This stuff is absolutely amazing served on top of some buttery, nutty basmati rice and piece (or two) of homemade warm garlic naan bread! Absolutely to die! (Recipe for basmati and a new naan recipe coming soon!). The recipe calls for chicken thighs, still on the bone. I thought that was strange, but beside that I don't really like dark meat, and I definitely don't like meat on the bone. But serving meat on the bone with sauce over rice seemed completely absurd to me. So I diced up a boneless, skinless chicken breast and marinaded and broiled it like that. Worked perfectly! That would be my suggestion. However, I didn't cook it the other way, so it might be equally delicious like that. Just more difficult to eat I would imagine. I am in love with anything citrus! 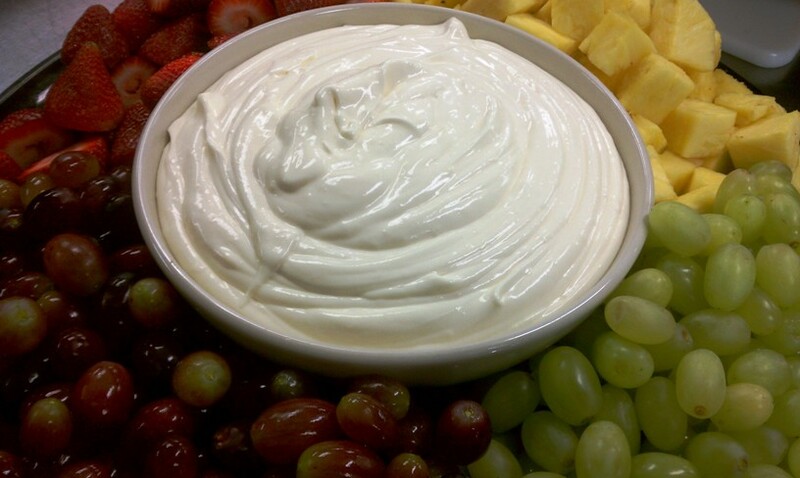 The same holds true with this fruit dip! 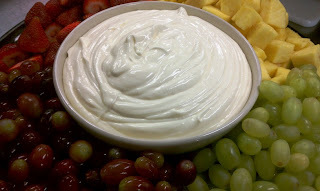 This was another parent conference recipe (the last to be posted), but it is not the last time that I will be whipping up this amazingly fluffy delight. So so so yummy! Next time I make this, I think I am going to add some orange zest to give it a little extra speck of color, but other than that I wouldn't change a thing. However, unlike the recipe, I added vanilla yogurt instead of vanilla pudding, but I will be trying the vanilla pudding version next time. Sounds divine! I am in love with caprese! Caprese salad, sandwiches or kabobs - I'm not picky. 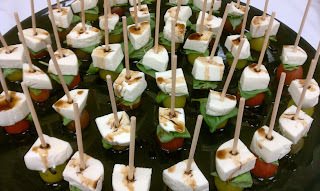 These kabobs were something that we served at parent conference a couple of weeks ago, and I LOVED the presentation! 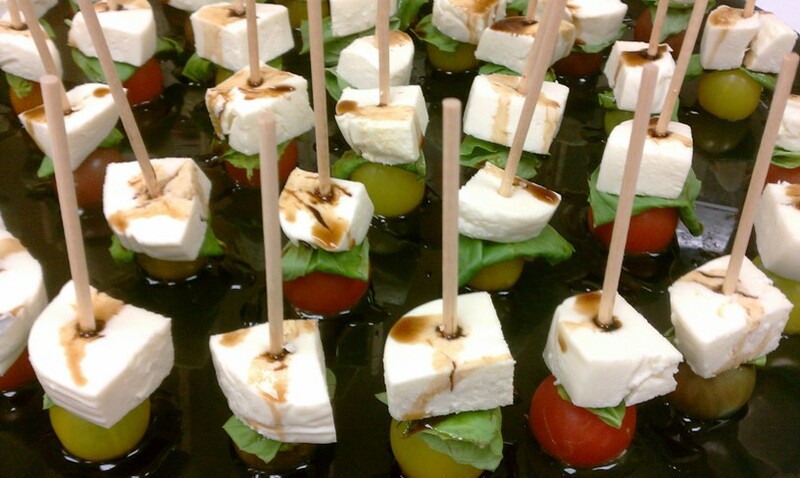 All you need is fresh basil, mini heirloom (or cherry) tomatoes, fresh mozzarella, balsamic vinegar and some little kabob skewers. Easy as that, and seriously looks so fancy! LOVE! 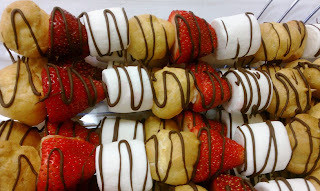 Remember the strawberry cream puff kabobs that I made here? Well, these are exactly those kabobs, only with a yummy marshmallow added into the mix! Not only is it a delicious addition, but I love the contrast of colors that the marshmallows add. 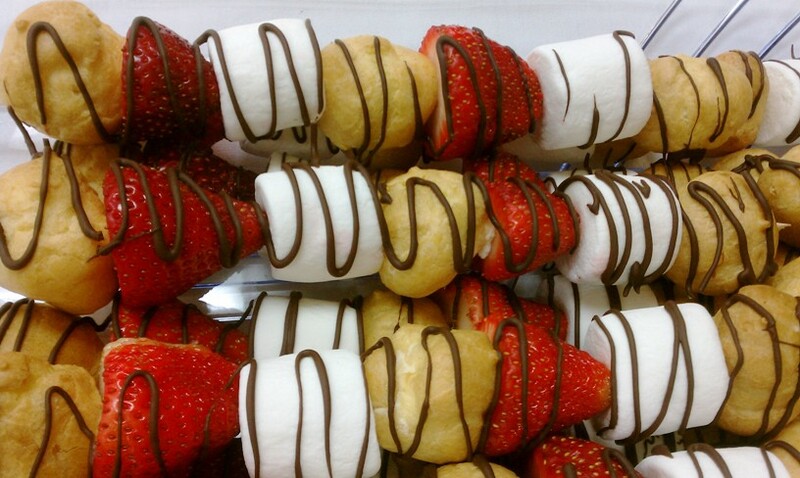 All you need are some strawberries, cream puffs (I got mine from the frozen section), marshmallows, semi sweet chocolate chips. and some skewers. 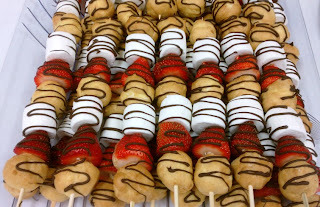 Skewer the strawberries, cream puffs and marshmallows in any order your little heart desires. Over a double boiler (or in a microwave safe dish if you prefer that option), pour about 1 cup of chocolate chips and stir until completely melted and smooth. 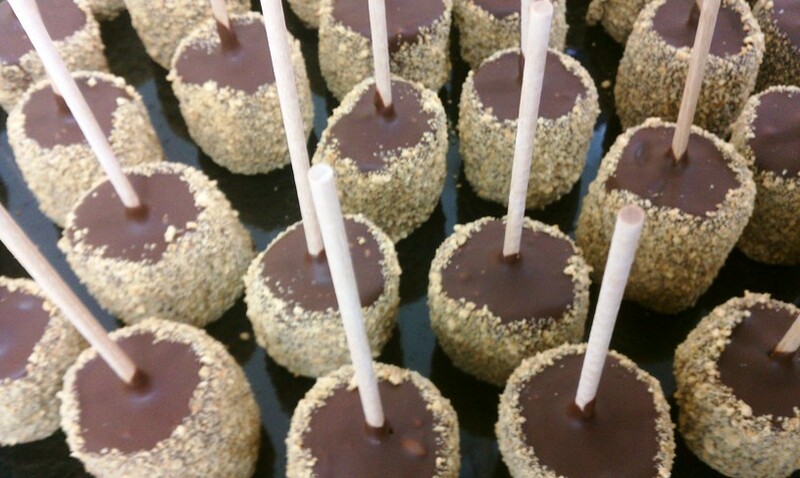 Drizzle the melted chocolate over your skewer of delicious goodness. Set aside for 5-10 minutes, or until the chocolate has hardened. Now eat your little heart out! These veggie dip cups would be perfect for any sort of entertaining event! They are a glorified veggie tray, all fancied up! 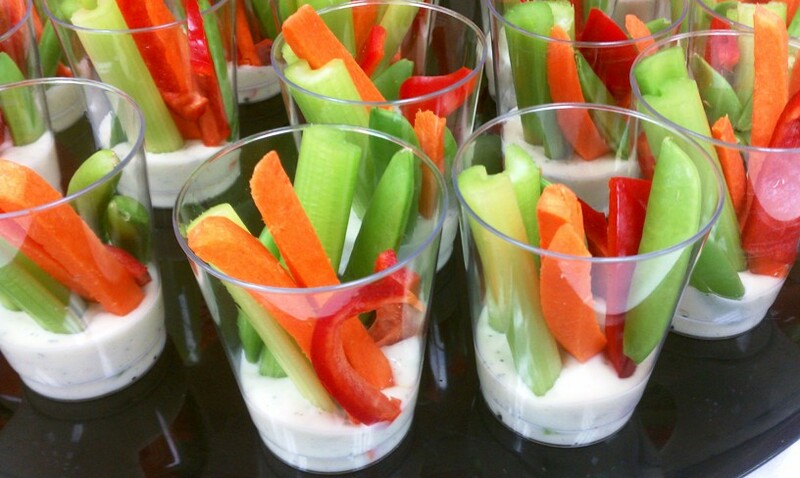 You can pick any veggies you would like, as long as they can be cut up into a long skinny dipping stick. I chose red peppers, carrots, celery, and sugar snap peas. Other possibilities include green & yellow peppers, cucumbers, green beans, and maybe some broccolini! Oooh, that would be yummy! I am fresh from a mini vacation to St. George, and I must say that it was just what I needed! September was a CRAZY month, and I am so happy that we all made it through. But I have never been more excited to go somewhere where I didn't have to think about work and could truly relax. And relax we did. Both days we slept in until 11:00, and took a 2 hour nap on Friday. Then we went and saw The Help (SO GOOD! ), and ate at our favorite breakfast spot, Bear Paw, twice! And that's it folks. That is all we did. A whole bunch of nothin. It was amazing! And now we are back to the real world. Wish our mini vaca could have lasted a little longer, but work awaits us. Oh, and did I mention that Taylor was so fun?? This is the first concert I have ever been to with the hubs. He even liked it! She sang and played acoustic the song "Animal" from Neon Trees (since they are from Utah) and it was SO GOOD! My favorite song that she sang. But I loved how she learned to play that song so that she could sing it here and only here. That is so cool! LOVE her! And again I continue with my s'mores obsession. I loved these s'more pops. And man, are they easy! Seriously. I wish cake pops were as easy to make as these little guys. And they are equally as delicious. We served these at our parent conferences last weekend, and they disappeared very quickly!